In truth, as these examples illustrate, it remains far too early to judge in any definitive sense whether the Turnbull government will chart a markedly different course for Australia in its relations with Asia’s major powers and, in turn, in Canberra’s approach towards the East and South China sea disputes. That said, while there will almost certainly be a change in the tone of Australia’s foreign policy away from that adopted by the divisive and sometimes abrasive Tony Abbott, this article argues that the initial months of the Turnbull government suggest that there is likely to be a greater level of continuity than change when it comes to the substance of Canberra’s approach towards Asia’s maritime disputes. Indeed, barring a handful of temporary policy oscillations, the case is made that the trajectory of Australia’s approach towards Asia’s major powers more broadly has actually remained remarkably consistent for the better part of two decades. Several sources of continuity identified in the concluding section strongly suggest that it will remain so under Turnbull’s watch. On balance, therefore, rather than reflecting any noticeable tilt towards China, the course of Canberra-Beijing relations during the early months of the Turnbull tenure would instead appear to have followed a similar pattern to that of successive Australian governments over the previous two decades. Indeed, the same Gillard Labor government which implemented the Huawei ban also worked with Beijing to upgrade the bilateral relationship to the status of a “strategic partnership,” which would include annual leaders’ meetings and twice-yearly cabinet-level strategic dialogues.21 On the South China Sea, Gillard’s foreign minister Bob Carr took a decidedly moderate line in a well received speech at the Australian National University in August 2012 when arguing that “it can often be better for parties to ‘agree to disagree’ about who owns what and to focus on how all parties can benefit.”22 Likewise, the hawkish Abbott administration presided over the conclusion of a free trade agreement (FTA) with China—a process initiated by Abbott’s pro-American mentor John Howard a decade earlier. As discussed below, the Abbott government also sought membership in the Chinese-led Asian Infrastructure Investment Bank (AIIB) in the face of strong American opposition. Far from being the aberration that many commentators were predicting, the early months of the Turnbull government, thus, appear entirely consistent with the conventional Australian approach to China policy. An episode that occurred early in Turnbull’s tenure seemed to confirm that his government would seek a greater degree of independence from the United States than had its predecessors. In October it emerged that the local government of the Northern Territory had agreed to lease for a period of 99 years a commercial port in Darwin to a Chinese company, Landbridge, which allegedly had links to the Chinese Communist Party. While the Australian Department of Defense had been consulted and given the leasing arrangement the “all clear” to go ahead, Washington was particularly disgruntled by the fact that it had not been briefed in advance and that the subject had not even been raised at the annual Australia-United States Ministerial Consultations (AUSMIN), which had been held in Boston during the same month. Contrary to initial predictions, therefore, Australia under a Turnbull government has not tilted sharply toward Beijing, relations with Tokyo have not stalled, nor has significant daylight opened up between Washington and Canberra as a result of the new prime minister charting a more independent foreign policy course. Instead, the early months of the Turnbull tenure have exhibited a much greater degree of continuity with recent Australian governments than many commentators were anticipating. While it remains early days, Turnbull has, thus far, pursued what might be termed an “engage and hedge” strategy toward rising China, as did the Abbott, Gillard, Rudd, and Howard governments before him. While reaching out to Beijing, he has simultaneously continued to keep Tokyo close by both broadening and deepening Australia-Japan security ties, as his predecessors—with the possible exception of Rudd—had also done. Indications, thus far, are that a Turnbull government will continue the long tradition of viewing the ANZUS alliance as the central pillar of Australian foreign and strategic policy. All of this, in turn, points toward continuity in Canberra’s approach towards Asia’s maritime disputes. The involvement of some of the same senior officials across successive Australian governments—such as the respected defense secretary Dennis Richardson—and of the influential foreign minister Julie Bishop—who will almost certainly act as an important bridge across the Abbott and Turnbull periods—provides one obvious source of continuity. Australia also has a series of enduring interests that will likely see Canberra remain a prominent non-claimant in Asia’s maritime disputes. A significant proportion of Australian trade, for instance, passes through the waters of the East and South China seas. As a middle power, Australia also has an oft-stated commitment to a rules-based international order and, thus, opposes coercive policies such as those pursued by China over recent years in Asia’s contested waters. Perhaps most important of all, however, Australia has a longstanding interest in a stable Asian balance of power. While recognizing that it lacks the requisite strategic weight to directly impact that balance, Canberra has for decades now behaved in ways that are consistent with keeping its relations with Asia’s major powers on an even keel.47 Notwithstanding the political turbulence that has been a feature of the Australian political landscape for almost a decade now due to repeated prime ministerial changes, this balanced approach looks set to continue during the Turnbull tenure. 1. Nick Bisley, “ADIZ: Australia right to speak plainly,” The Interpreter, November 28, 2013, http://www.lowyinterpreter.org/post/2013/11/28/ADIZ.aspx (accessed January 18, 2016). 2. Robert Ayson, “Japan steals the show at the Shangri-La Dialogue,” East Asia Forum, June 13, 2014, http://www.eastasiaforum.org/2014/06/13/japan-steals-the-show-at-the-shangri-la-dialogue/ (accessed 18 January 18, 2016). 3. James Massola and John Garnaut, “Australia ‘deplores’ unilateral action in South China Sea,” Sydney Morning Herald, June 29, 2015, http://www.smh.com.au/federal-politics/political-news/australia-deplores-unilateral-action-in-south-china-sea-tony-abbott-20150629-gi0lxj.html (accessed January 18, 2016). 4. David Wroe and Philip Wen, “South China Sea: Australia steps up air patrols in defiance of Beijing,” Sydney Morning Herald, December 15, 2015, http://www.smh.com.au/federal-politics/political-news/south-china-sea-australia-steps-up-air-patrols-in-defiance-of-beijing-20151215-gloc2e.html (accessed January 18, 2016). 5. Hugh White, “What a Turnbull-led foreign policy might look like,” The Interpreter, February 8, 2015, http://www.lowyinterpreter.org/post/2015/02/08/What-a-Turnbull-led-foreign-policy-might-look-like.aspx (accessed January 18, 2016). 6. Cited in John Garnaut, “Malcolm Turnbull changes direction on foreign policy: China trumps the Islamic State death cult,” Sydney Morning Herald, September 24, 2015, http://www.smh.com.au/comment/malcolm-turnbull-outlines-strategy-towards-china-20150924-gjtvts.html (accessed January 18, 2016). 7. Christopher Joye, “Liberal Leadership: Malcolm Turnbull the most gifted PM since Menzies,” Australian Financial Review, http://www.afr.com/news/politics/liberal-leadership-malcolm-turnbull-the-most-gifted-pm-since-menzies-20150915-gjmphr (accessed January 18, 2016). 8. Michael Welsey, The Howard Paradox: Australian Diplomacy in Asia 1996-2006 (Sydney, NSW: ABC Books, 2007). 9. Michelle Grattan, “Rudd stands by China comments,” Sydney Morning Herald, December 7, 2010, http://www.smh.com.au/national/rudd-stands-by-china-comments-20101206-18n1r.html (accessed January 13, 2016). 10. Peter Cai, “Malcolm Turnbull well placed to meet China challenge,” The Australian, September 16, 2015, http://www.theaustralian.com.au/business/business-spectator/malcolm-turnbull-well-placed-to-meet-china-challenge/news-story/040dd080786cdba6b4590fd9d9be51e6 (accessed January 19, 2016). 11. See Australian Centre on China in the World, “Huawei,” The Australia-China Story, http://aus.thechinastory.org/archive/huawei-%E5%8D%8E%E4%B8%BA/ (accessed January 19, 2016). 12. Malcolm Turnbull MP, “ChAFTA and rebalancing of Chinese and Australian economies: Speech to Australia-China Business Forum” (speech, Australia-China Business Week, Sydney, August 6, 2015), http://www.malcolmturnbull.com.au/media/China-Business-Week (accessed January 19, 2016). 13. John Garnaut, “Is Malcolm Turnbull ‘soft’ on China because of his family connections?” Sydney Morning Herald, September 15, 2015, http://www.smh.com.au/national/is-malcolm-turnbull-soft-on-china-because-of-his-family-connections-20150915-gjnbz8.html (accessed January 19, 2016). 15. David Wroe, “Marise Payne: Australia will oppose ‘intimidation’ and ‘aggression’ in veiled warning to China,” Sydney Morning Herald, October 7, 2015 (accessed January 19, 2016). 16. Phillip Coorey, “PM warns China risks isolation,” Australian Financial Review, November 23, 2015, 1; and Prime Minister, “Australia and the United States: New Responsibilities for an Enduring Partnership,” Center for Strategic and International Studies, Washington, DC, January 18, 2016, http://csis.org/files/attachments/160119_Prime_Minister_Speech_1.pdf (accessed January 21, 2016). 17. Brendan Nicholson, “Aussie frigates join China in live-fire exercise,” The Australian, October 29, 2015, 4. 18. Ben Schreer and Tim Huxley, “Standing up to China is essential, even if costly,” The Australian, December 21, 2015, 12. 19. Brendan Nicholson, “Top brass strengthens military ties with China,” The Australian, December 2, 2015, 1. 20. David Wroe, “Australian, Chinese officials’ tough talk,” Sydney Morning Herald, December 3, 2015, 14. 21. Linda Jakobson, “Breakthrough: Australia and China set to announce strategic partnership,” The Interpreter, April 9, 2013, http://www.lowyinterpreter.org/post/2013/04/09/Australia-and-China-to-announce-strategic-partnership.aspx (accessed January 19, 2016). 22. Senator the Hon Bob Carr, Minister for Foreign Affairs, “Dr Lee Seng Tee,” (speech, Australian National University, August 21,2012), http://foreignminister.gov.au/speeches/2012/bc_sp_120821.html (accessed January 19, 2015). 23. Hugh White, “An Australia-Japan alliance?” Centre of Gravity Series, Strategic and Defence Studies Centre, Australian National University (December 2012): 3. 24. Graeme Dobell, “The Abbott Strategic Trifecta: Japan as ‘strong ally,’” The Strategist, December 17, 2013, http://www.aspistrategist.org.au/the-abbott-strategic-trifecta-2-japan-as-strong-ally/ (accessed January 21, 2016). 25. Graeme Dobell, “Tony Abbott and a Japanese sub,” The Strategist, May 25, 2015, http://www.aspistrategist.org.au/tony-abbott-and-a-japanese-sub/ (accessed January 21, 2016). 26. “Turnbull’s China challenge over trade v. security,” Australian Financial Review, September 18, 2015, 7. 27. Malcolm Cook, “Malcolm Turnbull and bilateral relations with Japan,” The Interpreter, September 16, 2015, http://www.lowyinterpreter.org/post/2015/09/16/Malcolm-Turnbull-and-relations-with-Japan.aspx (accessed January 21, 2016). 28. Brendan Nicholson, “Defense ties with Japan to deepen,” The Australian, November 23, 2015, 6. 29. David Wroe, “Push back against China in disputed waters,” Sydney Morning Herald, December 19, 2015, 9. 30. Primrose Riordan, ‘Turnbull’s visit favours Japan: Chinese media,” Australian Financial Review, December 21, 2015, 6. 31. “Julia Gillard’s speech to Congress,” Sydney Morning Herald, March 10, 2011, http://www.smh.com.au/world/julia-gillards-speech-to-congress-20110309-1boee.html (accessed January 24, 2016). 32. Alex Oliver, The Lowy Institute Poll 2015, Lowy Institute for International Policy, June 2015, 9, http://www.lowyinstitute.org/files/final_2015_lowy_institute_poll.pdf (accessed January 24, 2016). 33. Rowan Callick, “’Don’t take sides’ in China-Japan Islands Conflict, says survey,” The Australian, January 6, 2015, http://www.theaustralian.com.au/national-affairs/foreign-affairs/dont-take-sides-in-chinajapan-islands-conflict-says-survey/news-story/4e2f4e8fad2f91672bc663ea7c8ba41e (accessed January 24, 2016). 34. Bob Carr, “ANZUS call to arms would fail the pub test,” Sydney Morning Herald, November 4, 2014, http://www.smh.com.au/comment/anzus-call-to-arms-would-fail-the-pub-test-20141030-11ecin.html (accessed January 24, 2016). 35. Malcolm Turnbull MP, “More than a mine, more than a market – history, empathy, economics in the China relationship,” Speech to NAB Australia-China Business Week, Sydney, September 5, 2014, http://www.malcolmturnbull.com.au/media/speech-nab-australia-china-business-week (accessed January 24, 2016). 36. Malcolm Turnbull MP, “Launch of 2011 PWC/Melbourne Institute Asialink Index” (speech, November 28, 2011), http://www.malcolmturnbull.com.au/media/launch-of-2011-pwc-melbourne-institute-asialink-index-see-more-at-http-webc (accessed January 24, 2016). 37. Andrew F. Krepinevich, “Darwin port deal with China’s Landbridge group an unforced error” The Australian, November 17, 2015, http://www.theaustralian.com.au/news/world/darwin-port-deal-with-chinas-landbridge-group-an-unforced-error/news-story/c4121404f8767eb2cddd940cd6893a59 (accessed January 24, 2016). 38. Lisa Murray, “US in talks on Darwin Port,” Australian Financial Review, December 4, 2015, 3. 39. 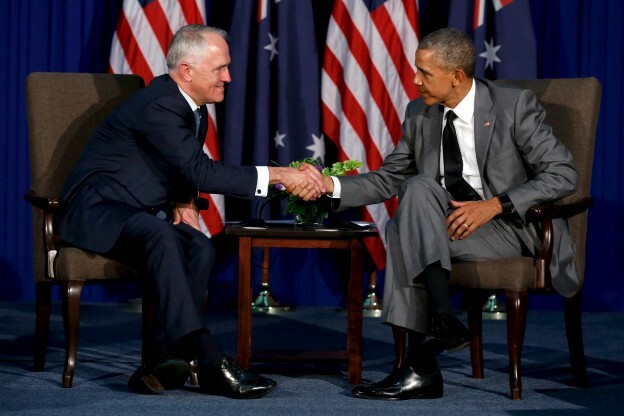 Phillip Coorey and Laura Tingle, ‘“Let us know next time: how Obama chided Turnbull over Darwin Port sale,” Australian Financial Review, November 19, 2015, http://www.afr.com/news/politics/let-us-know-next-time-how-obama-chided-turnbull-over-darwin-port-sale-20151118-gl1qkg (accessed January 24, 2016). 40. “Australia supports Japan’s return to ‘normal defense posture,’” Lateline, June 12, 2014, http://www.abc.net.au/lateline/content/2014/s4024426.htm (accessed January 24, 2016). 41. Greg Sheridan, “Taiwan gaffe puts delicate balance at risk,” The Australian, August 21, 2004, 31. 42. Hugh White, “B-1 Bombers Brouhaha: Minor Dispute, Big Rift,” The Age, May 19, 2015, http://www.theage.com.au/comment/b1-bombers-brouhaha-minor-dispute-big-rift-20150517-gh3v6v.html (accessed January 24, 2016). 43. See, for example, Hugh White, “Turnbull in Washington: a missed opportunity,” The Interpreter, January 19, 2016, http://www.lowyinterpreter.org/post/2016/01/19/Turnbull-in-Washington-A-missed-opportunity-for-American-ears.aspx (accessed January 24, 2016). 44. Greg Sheridan, “Hint of a challenge to China,” The Australian, October 17, 2015, 24. 45. Brendan Nicholson, “Darwin’s profit our loss?” The Australian, December 18, 2015, 11. 46. See, for example, Tom Switzer, “Malcolm Turnbull the clear eyed realist,” Australian Financial Review, January 19, 2016, http://www.afr.com/opinion/malcolm-turnbull-the-cleareyed-realist-20160119-gm94s0 (accessed January 24, 2016). 47. For further reading see Hedley Bull, “Australia and the Great Powers in Asia,” in Australia in World Affairs 1966-1970, eds. Gordon Greenwood and Norman Harper (Melbourne: F.W. Cheshire, 1974), 325-352.